← Can Big Data get us Better Estimates of Neighborhood Disorder? JAMA just published an editorial co-written by, Andrew Rundle, entitled “Can Walkable Urban Design Play a Role in Reducing the Incidence of Obesity-Related Conditions?”. The editorial provides a perspective on a study published in JAMA by Creatore et al., that assessed the prevalence of obesity and incidence of diabetes from 2001 to 2012, by level neighborhood walkability across 15 municipalities in Canada. Urban design to support active transport (walking and cycling) is an attractive avenue for public health interventions to increase population levels of physical activity and reduce the burden of obesity and diabetes. In the urban design/planning literature walkability is typically described in terms of the “D variables“: density of population, density of residences, density of public transit stops, design of street networks, and destination accessibility. In many cities there is not enough undeveloped space to create new large urban parks that support exercise and recreational physical activity. Local governments have some policy mechanisms for influencing neighborhood retail food access: tax and loan incentives can be used to promote the development of new supermarkets, but efforts to ban new fast food outlets are controversial and have not been found to be effective. However, improvements in neighborhood walkability can be promoted through permitting, zoning, land use regulations, and street design, activities all under local governmental control. In addition, although public transit receives state and federal funding, key decisions about transit capital investment and operations are made at the local level. 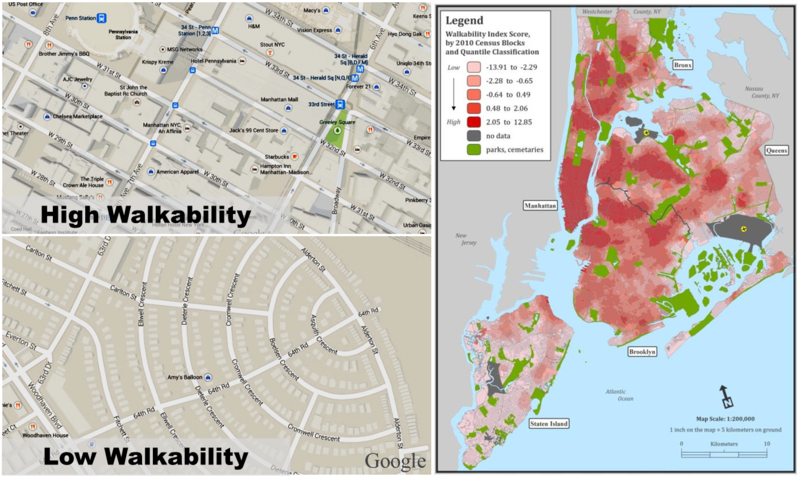 Furthermore our work in NYC finds that variation in residential neighborhood walkability is more strongly associated with physical activity than is variation in residential neighborhood access to parks. Similarly we find that variation in neighborhood walkability is more strongly associated with body mass index than is variation in neighborhood access to healthy food outlets, fast food outlets and park spaces.